Just 3 kilometres east of West Coast Wilderness Lodge is the world-famous Skookumchuck Rapids, the fastest salt water rapids in North America. Currents can exceed 16 knots — creating standing waves, overfalls and 20-metre-wide whirlpools. The contrast from our serene waters to the fierce, boiling tidal currents just a mile away is one of the most remarkable aspects of our tiny village here on the Sunshine Coast. 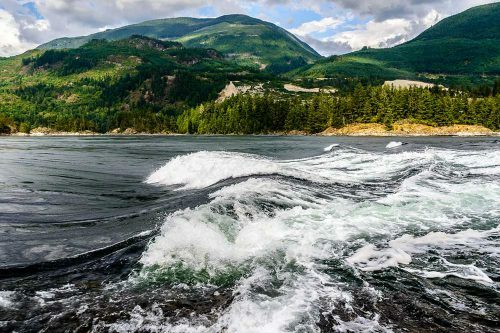 Skookumchuck means “strong water” or “turbulent water” in Chinook First Nation. The rapids are fascinating to watch in all seasons, and the best kayakers in the world come here to test their skills on a big tide. 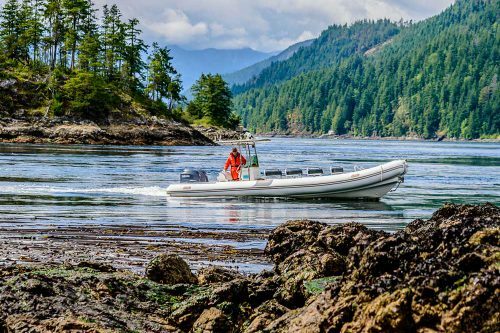 Two billion litres of nutrient-rich saltwater are pulled in every day by the Skookumchuck, making the incredible abundance of sea life in Sechelt Inlet possible. 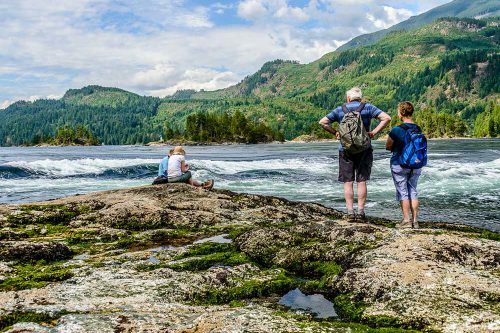 You can hike to the Rapids, borrow some of our mountain bikes, or go on an exciting boat tour right through it for a true coastal adventure. 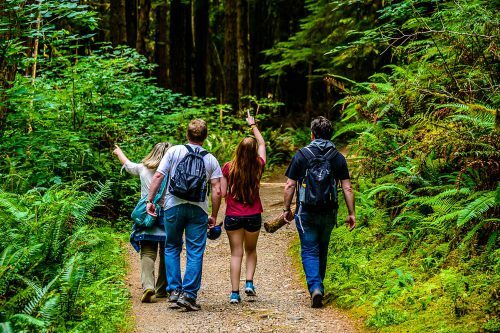 The leisurely hike will take you on an easy trail through a coastal rainforest filled with cedars and firs, sword ferns and salal, and a tiny lake with resident Loons. The trail leads to lookout points. The first lookout point takes you up on a bluff where you can look straight down at twenty-metre-wide whirlpools that form on the ebb tide. The second lookout point brings you right down to the water’s edge for the incredible show that occurs during a flood tide. On the flood, millions of cubic feet of saltwater rush through the Narrows and create an enormous standing wave. You can sit and watch the whitewater kayakers here. At a relaxed pace, the hike takes approximately 1.5 hours round-trip. 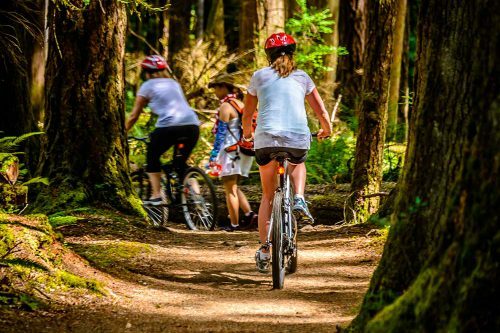 Why not borrow some mountain bikes and cruise the trail in style? If you are staying with us your bikes are included. 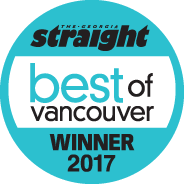 You can also go on an exciting boat tour of the Skookumchuck Rapids and some local Egmont sights. 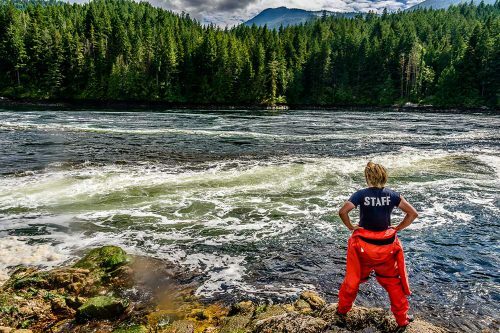 Your boat operator will explain the causes of the Skookumchuck, the history of the area and some local sights. Highlights include a visit with a friendly colony of local seals and an exploration of Sutton Islands, with resident Great Blue Herons and Cormorants, as well as many other sea birds in their seasons.